It’s a freeing thing, working with components. No expectations of outcome – it’s just creating options for future making. Experimenting with a new skill is fine – wobbly technique in one small part of a whole won’t be obvious, and “flaws” may hold exciting potential to take advantage of later. Follow a chain of thought and making, see where it takes you, respond to what’s in front of you. Why do we need permission to play? Work has continued on items begun in Mary’s workshops (17-Sep-2018). I’ve also ordered a couple of her books, here soon I hope. The looping on a 3D leaf shape is complete. The twining sample has grown. On the aviary wire form, the knotting has been following by twining, including some colour mix experiments with brass wire combined with the waxed linen. I’ve also had a session working through techniques with metal which Mary demonstrated. In the class I took lots of notes, but wanted to do the experimenting at home with my own setup and materials. Lots more to be done here. An image of a painted basket on instagram combined in my head with a painting by van Gogh in the John Russell: Australia’s French impressionist exhibition currently on in the Art Gallery of NSW. Yay! 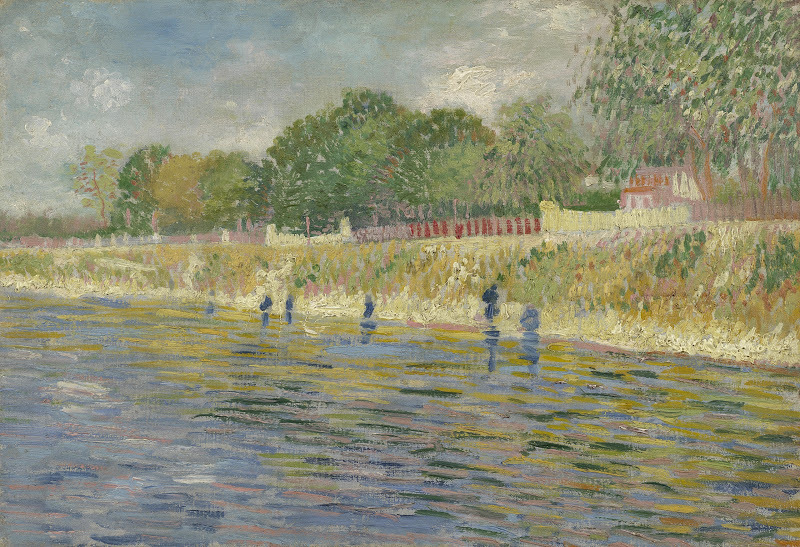 to the van Gogh museum for providing great photos plus easily available, generous and understandable copyright policy. Boo! to me, not able to trace the instagram photo that inspired me. Those baskets were painted with abstract blocks of colour, with white painted interiors. 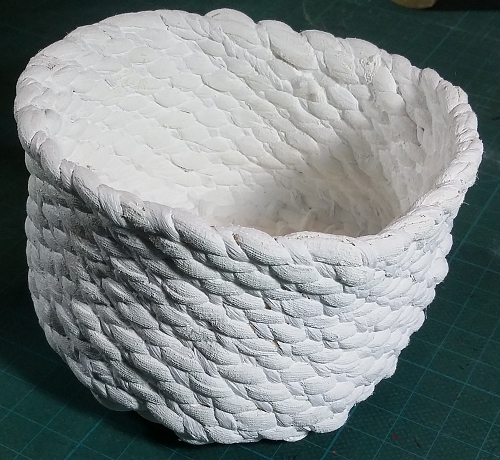 I made a coiled basket. The core was spaghetti yarn from Lincraft, a curled in length of stretchy, fine knitted fabric, 90% cotton, 10% polyester. Stitching was with Sullivan’s paper twine, 50g/32m. Quick and easy work – I love great long lengths of materials with no preparation required! 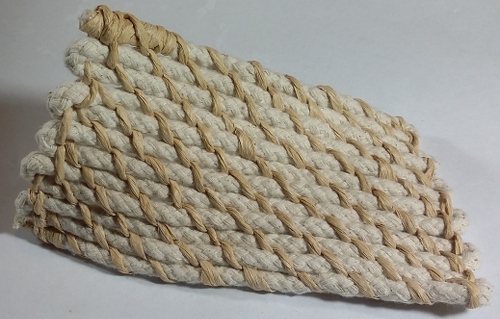 The firm twine pressed into the spongy knit fabric, creating a lovely bobbly texture. The thing was painted inside and out with gesso. At this point the structure was quite flexible and sagged when damp with the gesso. Reshaping was attempted a couple of times, with limited success. 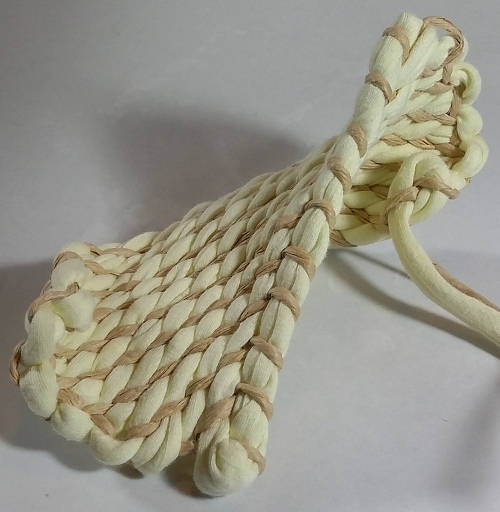 After drying overnight the basket felt firm and strong, no longer flexible. Originally I planned to paint the watery colours on the outside, then continue inside with colours lifted from the bank in the painting. As it happened I got impatient and tried to complete the outside in one sitting. Colours mixed more than I wanted. If I did this again I would try a layer of underpainting, establishing the base colour areas, wait for it to dry, then do stippling with the wider range of colours. It’s the way the textured surface of the basket catches little dots of colour that has me excited. 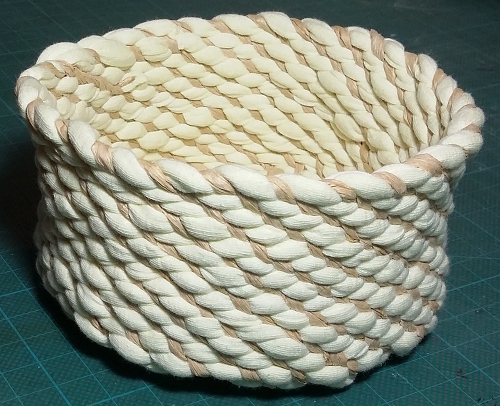 The basket form doesn’t suggest “component” in my mind, so experiments in creating a flat form using coiling followed. Using the same materials, I found some ways to manage the turn-around at the edges which looked OK. However, the form itself … there’s a fair amount of torque there. I was thinking of flat panels, building materials. Was the twist a function of the materials used, the knit fabric, the plied twine, or inherent in the technique, that lovely diagonal of stitching, with forces that balance out in the standard circular form? The next attempt used a very stable braided cord from the hardware store, still stitched with the paper twine. The torque is still there, much reduced. Possibly it could be forced flat when damp, but the price is the loss of that beautiful bobbled texture. Onto the stamping / printing experimentation pile for both of them. Speaking of which, it looks like I’ve run out of time this long weekend for a print making session. Preparations have continued, but instead of cutting stamps I’ve focused on more basketry techniques. There are a couple of panels of looping in a chunky, soft, loosely plied cotton yarn from the hardware store. I’m hoping this fabric will print more clearly than the previous looped version in paper covered wire. At this point I haven’t mounted the pieces onto a backing to form a stamp. 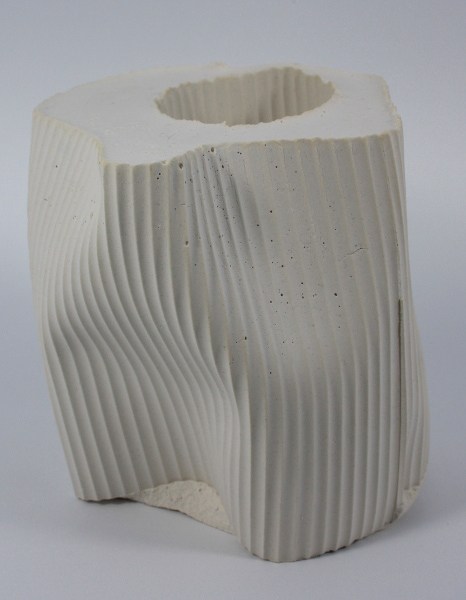 Perhaps some interesting partial and folded forms could be made by dropping the pieces onto the print surface. I’m thinking back to an earlier accident experimenting with printmaking in OCA days (18-Oct-2015). A final stamping experiment is more looping, this time around a piece of card, simplifying any mounting considerations and taking advantage of the nature of the technique. 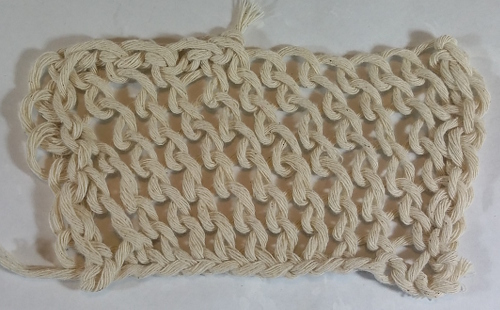 This is a thick wool yarn, the looping based on a demonstration from Mary Hettmansperger, deliberately making angles and variation, changing up the traditional technique. I should probably seal it before attempting to stamp. Turning from stamps and print-making back to components for future projects, what are some other shapes that could act as a base for looping? Mary has done a lot with a leaf shape, which could be modified to a boat – neither of which fit with the more abstract, geometric vibe of this theoretical future sculpture. It turns out doodle-ing shapes flat, in gimp or on paper, is hard! After a while I turned to paper covered wire, which was a bit too flimsy, then a heavier wire. Whatever. Moving to triangular forms generated a lot more possibilities – all needing refinement. However the brain has grasshopper-ed away from that to thoughts of looping around a geometric form, which (stroke of genius?) could then be used as a joining element in the sculpture. Think of something like the foam florists use (the dry type for artificial or dried flowers, not the stuff that soaks up water). Cut to shape, paint to colour scheme, cover with looping, then stab wire through when building. I wonder if that stuff is stable over time? Not having any to hand when the idea hit, instead I looped around a wooden block. There’s still joining component potential, drilling holes as required. The prototype used 28 gauge black wire. The wooden block was painted orange/red, which keeps it in the colour scheme of the painted yarn created in Mary Hettmansperger’s class, and I think is light enough to show up the dark wire. This photo is a fudge, because I haven’t actually finished the final side of the looping. The empty looped cube is pretty nice on its own. Possibly not sturdy enough for frequent handling, also less practical as a joining device. But good-looking. Another experiment using a thicker brass wire (0.5 mm) around a larger rectangular block is in progress. I’ll probably complete that, but I should also play with covering just parts of painted blocks. All of these things are going on in a huge muddle on my worktable. Picking up one thing, going back to another, brain fizzing with ideas. It feels good to be playing making. Encouraged by Claire at Tactual Textiles, I’ve been playing with some design exercises based on a book we both own. See Claire’s posts at https://tactualtextiles.wordpress.com/tag/design-experiments/. I see my approach as slightly different. Rather than building a resource to use directly, I’m hoping to train my eye to recognise and enhance potential, exciting things happening, when I am building sculpture in a playful and “instinctive” way. Muscle building exercises for instincts? Rules are made to be broken, but so far I have two. First, use forms that have already captured my interest (particularly sculpturally) as a base. Second, make this primarily a physical exercise, not too computer-based (for muscle memory?). 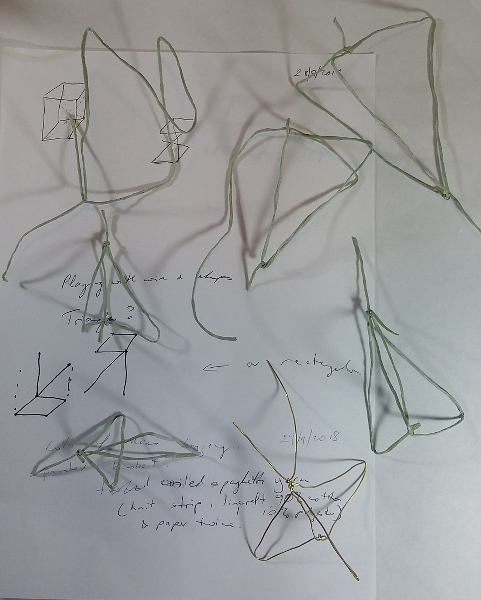 So far my base forms have been sculpture play following the workshop with Matt Bromhead, incorporating a piece from Marion Gaemer’s class (4-Aug-2018), sketching based on that work (some seen 5-Aug-2018), and a painting by Rodchenko that excited me in the MoMA exhibition (15-Sep-2018). This started focused on one of the plaster bases, and only really came to life when I added vertical elements based on the wires in the sculpture. I had trouble getting enthused on this exercise, avoiding actual collage by moving the pieces around then taking a photo. I wanted to get my hands dirty. This is meant to be 30 days of cutting stamps, with 30 stamps produced. I’ve made just three, and haven’t decided whether to continue. 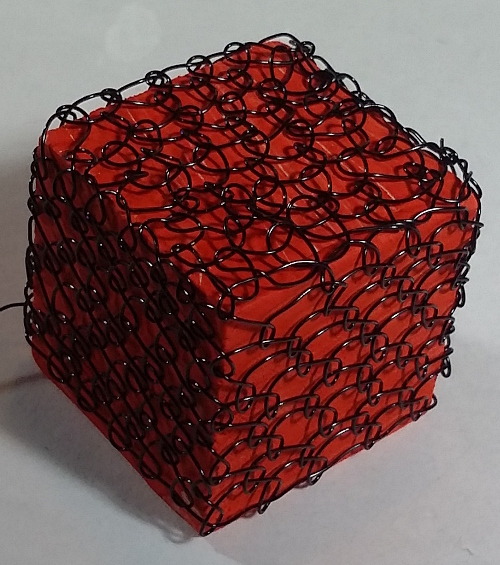 First was in ezi carve, based on the black-covered wire form. Then string on cardboard for Rodchenko’s descending row of lines, and some looping in paper-covered wire mounted on cardboard from the sketch and my sculptural component making. They had been used before I thought to take a photo. 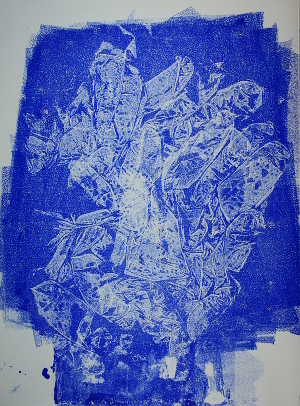 Attempts to print onto cartridge paper using acrylic ink were mixed. Some I used the stamps to stamp, some I used them more like a printing plate, putting cartridge paper on top and using a brayer. Then I got out the gelatin plate I made for OCA (first post way back – 7-Dec-2015! that thing has lasted well). Below is a selection of my favourites. The dark|light ones had the plate inked on one half. The stamp went into the inked side, then was “cleaned” by pressing it into the un-inked side. Have I learnt anything so far? I’ve been reminded of things I done and enjoyed in the past. I’ve played, explored, made. After the excitement of the workshop with Matthew Bromhead (10-Jul-2018) I felt inspired and keen to start working. I wanted to combine lots of the ideas from Matthew’s class with techniques and materials I’ve worked with in the past. For a start, from Ruth Hadlow – not knowing where you will finish, be very clear on where you start. A few weeks have passed since I started writing this post, there’s been some activity, but at the moment it feels like a tangle of threads and I can’t find a loose end to start work on. Blocks of time. Make space to work in the moment. 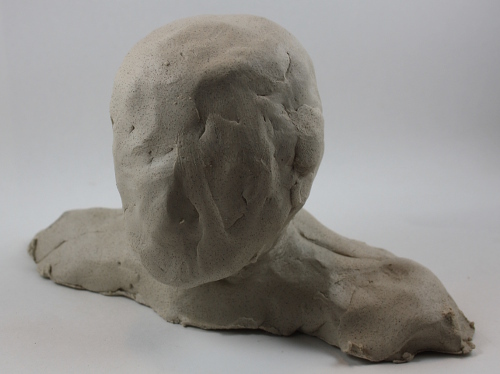 Casting plaster using a clay mould (demonstrated by Matt Bromhead). 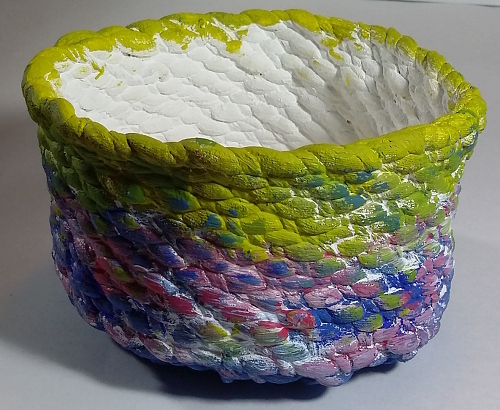 The clay was lined with ribbed plastic, thinking of sample p5-11 from the Mixed Media course (23-Feb-2016). I don’t like the proportions. The plaster is a bit squat. The mouse mesh is too orderly, too fixed. But there’s some movement and shimmer in the wires. 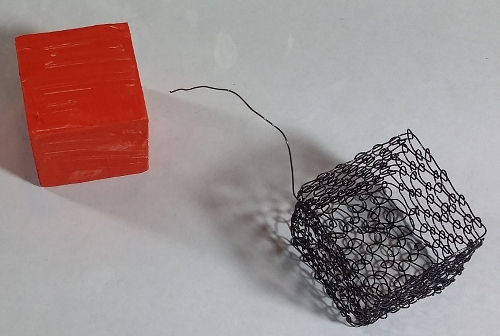 The second cast tried a couple of ideas – different surface textures, different angles for wire insertion. An ugly lump. I used these together with one of the experiments from Matt’s class to try some joining methods. Small lengths and pieces made by looping with florist’s wire. This version the larger wires were threaded through, in another a slightly longer, thinner looping was twisted around, almost like a bow. Stays in place fairly well. Brings a level of detail and interest that I like. It also works on a single wire, not a join, as a small focal point. Another variation, this time a larger, square piece of looping. I had great hopes of this. 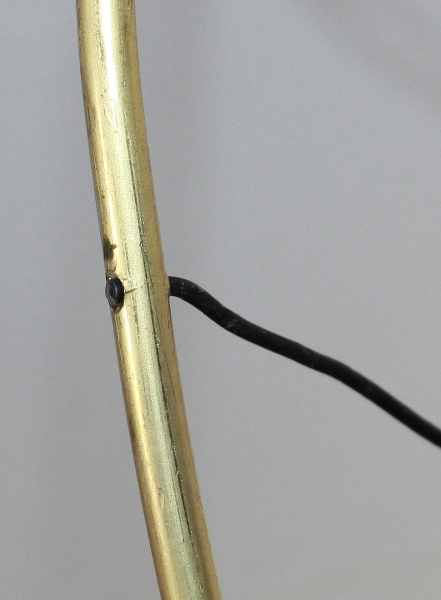 A hole drilled through the thick brass rod, rebar wire threaded through, a bit like an incomplete rivet. Drilling the hole was slow and awkward. The end result is effective as a join of two wires, but doesn’t really contribute anything else. It might be useful in some circumstances, but hardly exciting. Holes drilled in a shard of resin and wires threaded through. Great introduction of colour and shine. Possibilities. Two lengths of rebar wire were connected by weaving across them with florist’s wire. An extra length of rebar wire was added in. Lots of movement and form-building potential. I like the level of detail that can be achieved. 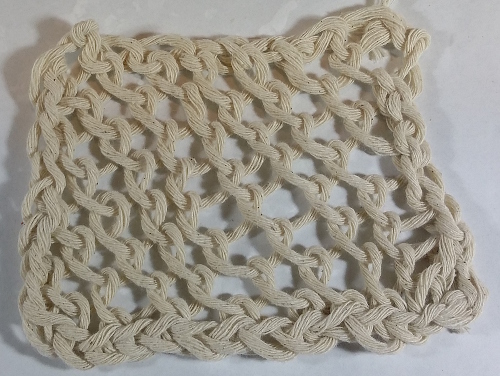 A simpler variation of weave also works quite nicely. Unhappy with the mouse wire used in the earlier plaster cast, I took a couple of photos with a wrapped wire sample from a class with Marion Gaemers (26-Dec-2017). Now that gets the blood moving. I’d want to wrap the wire after it is cast in the plaster. I also like the way the wrapped wire goes to the side, below the top of the plaster. How much manipulation could be done after casting? I wondered about making my own variant of a larger grid. 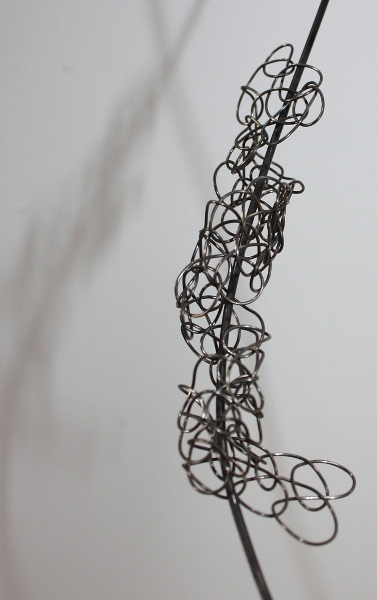 Some lengths of rebar wire, quickly joined with simple wrapping of florist’s wire. The sample has a unfortunate suggestion of a trussed chicken ready for roasting. This exhibition was previously code-named “other potential project” (14-Jan-2018, 21-Jan-2018, 4-Feb-2018) and “confluence” (18-Feb-2018, 25-Feb-2018). The second code-name was actually the name for the new work I’ve made for the theme. In brief, the question I asked myself was – could I bring together all the different materials and techniques I’ve been experimenting with over the last year or two and bring them together coherently – in balance and harmony? Were they just so many diversions, or were they currents and channels in a greater stream? Secondary question – could I remain provisional, keep experimenting and exploring, right to the last moments available? The answer to both turned out to be a slightly vague “well, kinda, pretty much…”. The time I used to the last drop, assisted by misreading the due date and discovering I had a week less than I thought. Some materials and techniques weren’t used, and more components didn’t survive a pretty fierce editing. It’s enough for me to feel that it fits the confluence idea, the streams of inquiry and exploration coming together, at least momentarily. 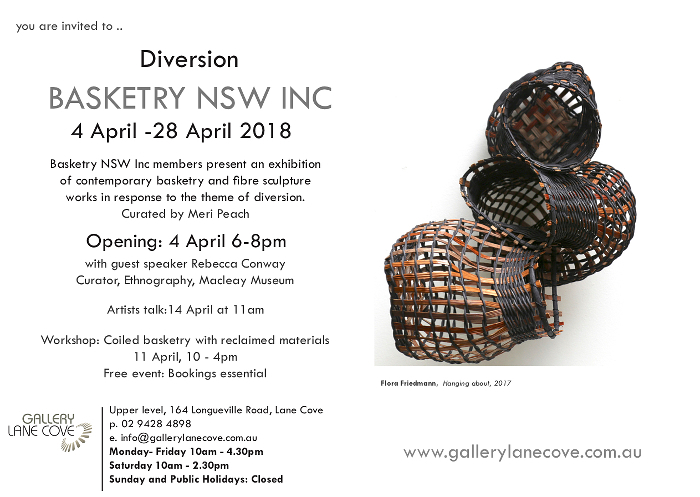 For any readers who will be in Sydney over the exhibition period, it would be great to see/meet you – particularly on the opening night or for the artist talks. 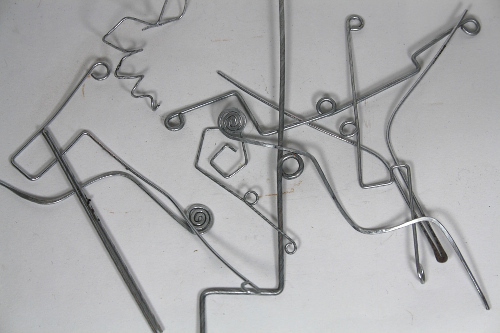 I’ve been circling around, making different starts with wire, seeing what might come together. Ages ago (last year?) in a drawing class, tutor Sue Vesely brought hard boiled eggs marked up to show various angles and spacing of the human head. I’ve since made a version of my own, using Sue’s notes and a toy (rubber?) egg. 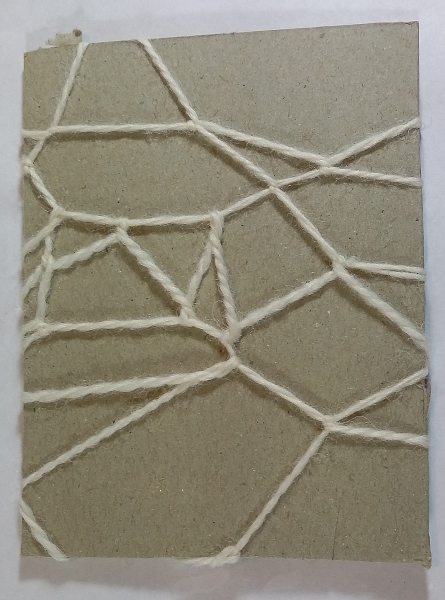 Could I make these shapes and lines using wire and random weave basketry techniques? … some of it into this face. Which also doesn’t particularly thrill me. Clumsy lines, not the right selection of which lines to include. This weight of steel (construction wire, annealed steel, 1.57 mm diameter, 16 gauge) was difficult to work with at this scale (slightly less than life). Not a dead end, but not an enticing path for now. Another experiment using broken ceramic and wire in random weave also didn’t quite work for me in its first form. The same steel wire, smoothed and drilled fragments from a cup and saucer, random weave. The blu-tac is to hold bits in place until I could stabilise placement. Each shard has 3 holes, which I thought would allow enough connections to create a stable non-vessel. Once again the gauge of the wire, its stiffness when working, caused me grief. When bending wire I was constantly at risk of breaking ceramic, and without sufficiently bending the wire to hold them the pieces kept sliding around. More recently I’ve been introduced to galvanised steel wire. Lots of different gauges in the hardware store, doesn’t rust (although the shine wouldn’t suit all purposes), not a good choice for jewellery, but a great new option in this kind of work. The old 16 gauge wire has been cut off and new work begun. It’s going reasonably well, but needs to progress before any more photos. More of the same 16 gauge wire and the ceramic, and still not satisfied with the various possibilities I’ve generated so far. The proportions of the ceramic and wire elements isn’t pleasing. The curve of the wire (from my new dapping set) doesn’t sit well with the different curves of the ceramic pieces. Beads of different sizes have been trialled at different positions, and then the earrings get too long. I’m really not in a grouchy mood and I don’t think the inner critic is getting out of control. There are possibilities here, just so far none I would wear. It will come. Now some happy snaps. 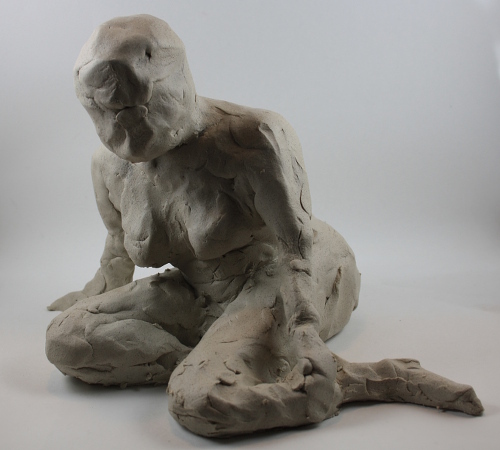 My friend Claire and I got together for a day of dipping wire in paper pulp. Neither of us had previous experience, so it was all free experimentation. Claire brought the pulp – made from waste cardstock. We both had different types of mesh and wire. There’s more detail and process shots on Claire’s blog – https://tactualtextiles.wordpress.com/2017/08/07/paper-pulp-dipping/. Above: the pulp built up well on bird wire mesh. On the left is the form as dipped. When dry I was able to change the form, the paper remaining attached. Above: two views of a form created before the mesh was dipped. A much firmer and sharper end result (compared to re-shaping a dipped piece). Above: two more vessel forms, quickly random woven together using galvanised wire. I’d like to try this again with more preparation time, creating smaller spaces that the pulp would span better. It tended to slide off these. 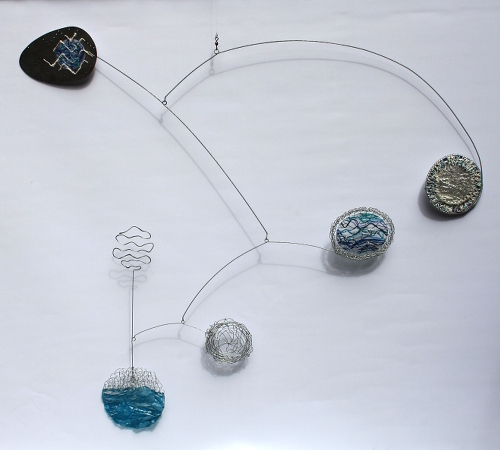 Above: a range of forms, wire and an offcut of bird mesh. The pulp held better on the smaller spaces. Above: the “flower” wouldn’t hold the shape. Some extra fine wire across the leaf helped marginally. The two views of a single “earring” show the impact of lighting on this material. Above: the two sides of a piece of copper mesh that I had distorted. Above: more mesh and pulp experiments. Love the combination of copper and the warm cream of the paper. There’s lots of promise in these results. Some lessons learnt, some really nice effects. I’m hoping Claire and I can arrange another day – with enough lead time for more preparation. Maybe a series of days (or in summer?? ), so we can let things dry between dippings. Finally, some first steps following Keith Lo Bue’s Poetry in Motion DVD workshop – http://www.keithlobue.com/product/poetry-in-motion-making-marvelous-mobiles-dvd-workshop-set. This is what led me to galvanised wire, opening various doors as mentioned above. I’ve worked through the first couple of exercises, and am feeling excited and inspired. 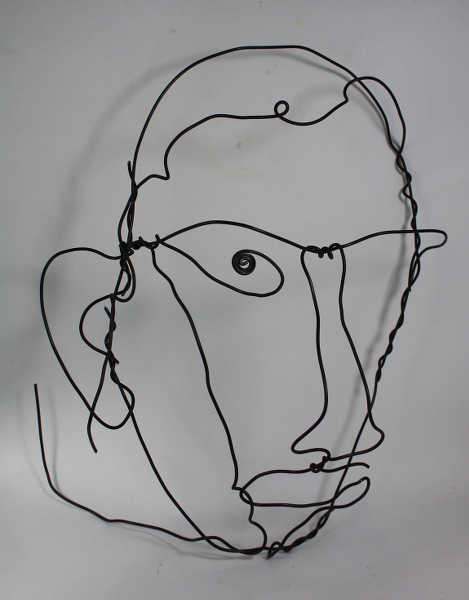 First up was a clever way to straighten wire, plus practice in creating precise shapes and angles. I think a series of these piled up has much more promise of an interesting and dynamic composition than my earlier attempts at wire lines at the top of this post. Next was an exercise learning to find and fix balance points. Back to 16 gauge wire (galvanised this time), plus corks. 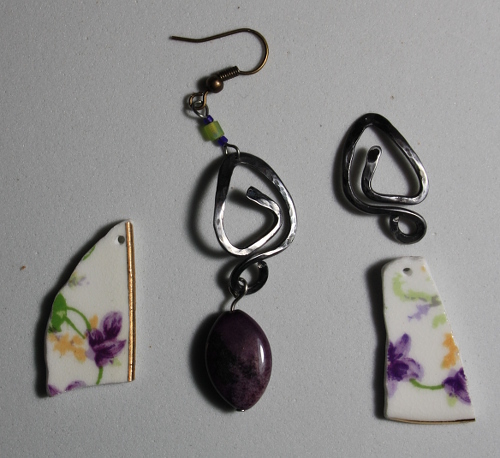 Above: my very first mobile, in two variations. On the left, a flat, horizontal form that spreads out in space. On the right, a simple change in the orientation of one looped end changes the form to a broken straight line, descending in space. I can see potential for a number of the approaches above to combine into a fruitful line of investigation – even those that left me cold as stand-alones. It’s the end of the weekend, work tomorrow, but I’m rubbing my hands in anticipation. This one day class at Sydney Community College in Rozelle was engrossing and satisfying. Kassandra is a warm, supportive and encouraging tutor. For me it was a wonderful combination of my recent learning in life drawing with my interest in developing my work toward three dimensions. Our material was clay (Keane’s white raku), and just a few simple tools. We were given the task of modelling an elephant to introduce us to the clay. It is so pleasant to work with. This really brings the haptic element to work – very welcome to one with a history of working with textiles. Then our model arrived and we were introduced to the work process. The model posed on a table set in the centre of the room. Touching and almost surrounding it were more tables, with just a short gap at one corner for access. We worked on boards, 10 of us distributed in a circle around the model. After a short period we would move to the next position, reorient our board, and continue working. Eventually we would work our way around the circle and have seen the model from every angle (we could climb up on stools for a top view). In the first pose we were to focus on the torso – no limbs. For me this made apparent a difference to drawing. Normally you’re fighting to ignore what you “know”, to draw from observation. 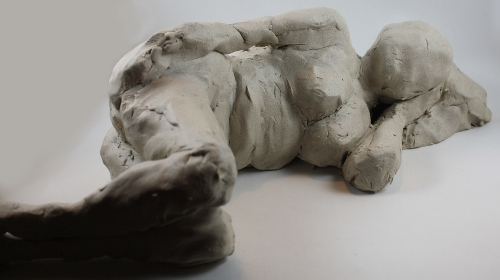 For this sculpting I found using my own knowledge and experience of the body was helpful, especially when an arm obscured the torso. However what we know is always a dangerous thing. Some of the heads in the class looked more like a ball balanced on a short cylinder, and I think virtually all of us had the head too small. 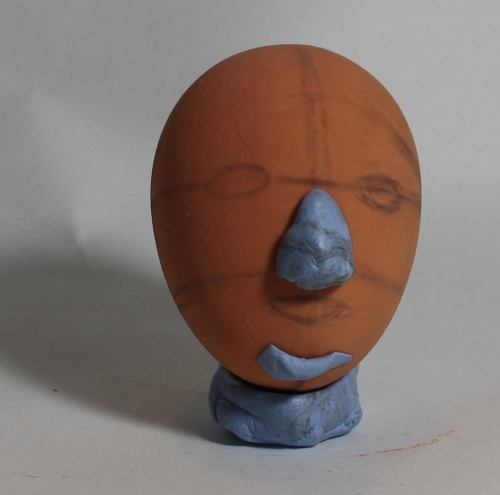 Kassandra asked us to focus on the head and how it sits on the body in our third attempt. A reclining pose raised new problems. Parts of the body were pushed around or hidden by cushions. It was difficult to avoid having the body look like it was emerging through the table. Throughout the day Kassandra continued to introduce new ideas, or refinements of technique. We needed to think about proportion, weight, volume. Light shows form, and I love the way light almost seems to caress this clay (I haven’t seen it fired, but presumably it could look quite different). There was a wide variety in results. Some students used transformations, interpretations – definitely not literal representations. I tried hard to reproduce what I was seeing. I also noted again that I naturally use an additive style, building up material rather than carving out. The timing of poses varied. First time round I think we had 2 minutes at each position in the circle. Later it was generally 4 minutes and sometimes completing two circuits but moving two positions each time. We all became more and more reluctant to move on, always wanting to do just a little more. In the final pose of the day the model was hunched forward, putting a lot of weight on her arms. Without an armature my work kept sagging forwards. Kassandra showed me how to build up and strengthen the arms. 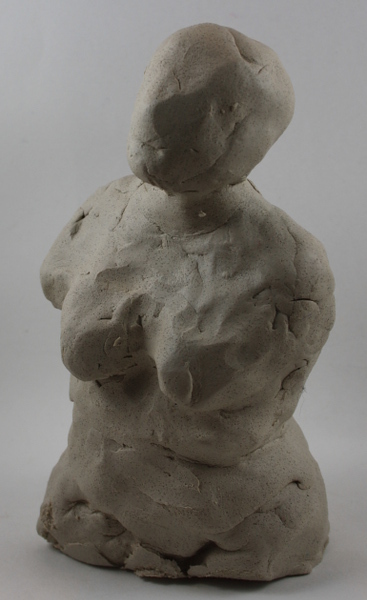 In theory I could work on the clay when it is dry, fix up the shaping a bit. A week later and the clay is far from dry. Sydney has seen a lot of rain, but none of the winds and flooding the north has experienced. Kassandra finished the workshop with a lot of information on how to prepare the work for firing. I haven’t decided yet which if any I will take to be fired. There’s also the question of finish. I never had time to blend in the extra material as I was adding it so the figures look very patchy, a little Frankenstein’s monster. I actually really like that, the way light is broken up, and wouldn’t want to do a lot of smoothing or try to “correct” any mistakes. No hurry to make a decision – but I was in a hurry to book into Kassandra’s next life sculpting workshop. Given my place is secured I am happy to recommend the class (link) to you all.